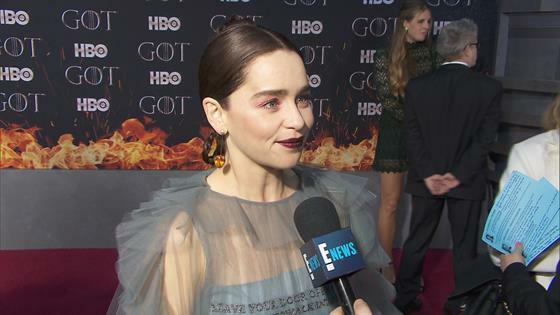 Emilia Clarke: Game of Thrones' Daenerys Targaryen Is "So Much a Part of Who I Am"
For better or worse, Emilia Clarke will likely forever be associated with Daenerys Targaryen and Game of Thrones. That's not a problem for the Emmy-nominated actress. "I mean, as an actor, as a schmaltzy actor, I believe that every character that you play, they kind of stay in you a little bit, you keep them with you. But yeah, Khaleesi it's like another limb. She's just so much a part of who I am," Clarke told E! News at the final season premiere in New York City. Clarke returns for the eighth and final season of Game of Thrones premiering Sunday, April 14 on HBO. Details are being kept under wraps, but we know Dany—and her dragons—make their way to Winterfell. It's not exactly a warm welcome, and that's not a pun about how cold it is in the north, especially when it comes to Sansa Stark (Sophie Turner). "It's really surreal," Clarke previously told Harper's Bazaar about what it was like to bring Dany to Winterfell. "I mean, you play into what it feels like for the character as well, because it's new and it's odd, and you're coming into someone else's turf and you've got a lot of actors that you know really well, who were like, 'This is our home.' Then you come in and you're like, 'I know this only from the television; I've never been in this space here before in my life.'" Click play on the video above to hear more from Clarke and be sure to watch E! News at 7 p.m. for more premiere coverage. Game of Thrones premieres Sunday, April 14 at 9 p.m. on HBO.